Did you miss Columbus Day Savings this year? You do not have to be sad! 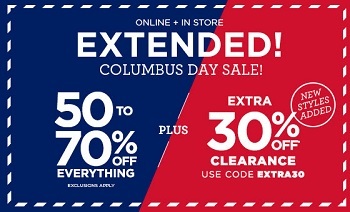 U.S. Aéropostale just extended their Columbus Day Sale! It is possible to receive discounts between 50% and 70% from original retail prices. Source of the information is U.S. Aéropostale. Offer is valid until October 11, 2017. For more details visit your nearest U.S. Aéropostale store location or U.S. Aéropostale online.